A southern traditional style home with handicap accessible features describes this home. 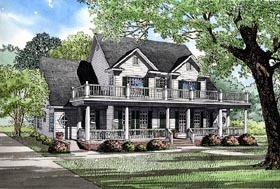 Imagine welcoming friends and family on the full length front porch with beautiful columns. Inside, the feeling of grandeur is evident with the spacious great room, with convenient computer center nearby. A charming wrap around window seat in the breakfast room provides conversation over coffee. Your master suite features a personal exercise or hobby room. Upstairs, you'll discover the children's bedrooms, an office and home theater room for weekly showings.